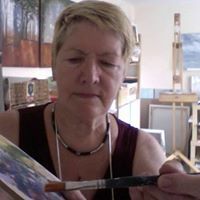 ​Podi is an international award winning artist who has been leading painting holidays since 1993, in France, Canada, Panama and the UK. Living on the Isle of Portland in Dorset, she is also a full time artist painting commissioned portraits as well as landscapes/seascapes and anything that inspires her. ​She has exhibited with some of the top “art Societies” including the Paris Salon where she won a Bronze Medal in 1993. She believes in the painting holiday concept as means of improving your art, as places like Kalymnos provide surroundings and inspiration totally different from the ‘norm’. A week of water colour which will progress your painting. While learning by demonstration and explanation you will find your own style and methods. An enjoyable and informative week for all - painting in the beautiful scenery and light of Kalymnos. This will be Sue's second course here on Kalymnos and we can promise you a week of learning, laughs and lovely scenery. Sue’s week is full of encouragement and experimentation. Leading by example with demonstrations and tips and techniques you are sure to learn a lot on this week. This will be Alison's third course here with us and it is always a brilliant experience - always encouraging and enthusiastic her sessions are both creative and fun. while encouraging freedom in your approach. ​including demonstrations this is a course not to miss.